'Rock music' is a general term that covers many different genres of music which have developed since rock ’n’ roll in the 1950s. There have been many stylistic changes in this period. The song is in verse and chorus form with three verses and two choruses. Each of the verses has an introduction. 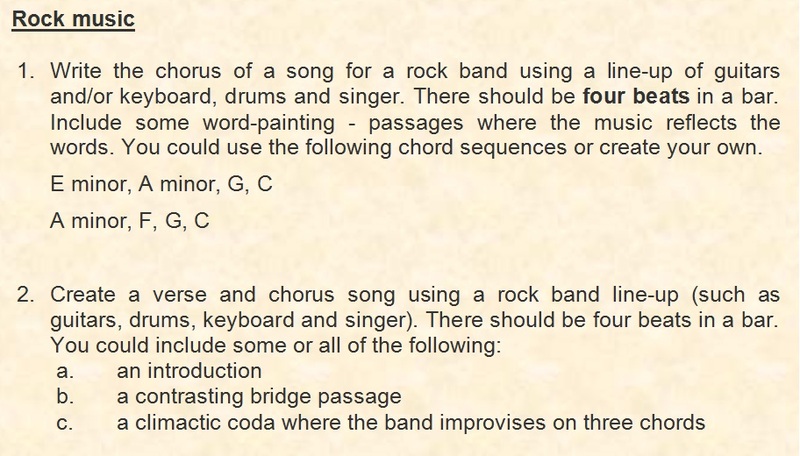 There is a bridge after chorus 2. The song ends with a climactic coda based on the chorus. The verse usually has different words with each repetition. A bridge is a contrasting passage. A coda is a section which comes at the end of a song. Melisma is where there is more than one note per syllable. A cross-rhythm is the effect produced when two conflicting rhythms are heard together. R 'n' B emerged in America during the late 1980s with artists such as Janet Jackson and Whitney Houston. It is sometimes known as urban R 'n' B. It is not to be confused with earlier R&B (rhythm and blues), a style of black American music combining jazz and blues which emerged in the 1940s. Close harmony is where the notes of a chord are close together rather than spread over a wide range. Contemporary R 'n' B artists include Rihanna. Listen to 'Stay' by Eternal. Notice the melismatic vocals and the use of programmed drum rhythms. A sampler is a device that can take any sound that is put into it, process it and play it back. A sample is a digitally recorded fragment of sound: it could be an bass guitar riff, a song chorus, the sound of breaking glass, or indeed anything. Hip-hop originated in the Bronx area of New York in the 70s. Its vocal origins lie in the Jamaican 'toasting' tradition. Toasting is a cross between talking and rhythmic chanting which was originally practised by Jamaican MCs.Black DJs such as Grandmaster Flash and the Jamaican-born 'father of hip-hop' Kool Herc extended the instrumental sections (or 'breaks') from records by mixing between two identical copies of the same record. Some of the DJs (or MCs) rapped over the top of the breaks. Dancers would get up during the breaks and perform a highly gymnastic style of dance using head and back-spinning. They became known as breakdancers.